The easiest way for practical and uniform irrigation of a small green space. Ready for immediate use, it guarantees uniform and gentle irrigation, without puddles, creating a fine mist rain effect. 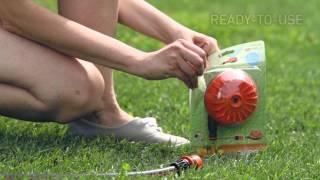 Made in sturdy plastic material, it is easily dragged to the lawn wherever it is needed, without damaging the grass. New compact, contoured design for easy movement over lawns. Stationary sprinkler produces a fine spray for watering circular areas.